Quick to respond to calls for new features from our customers, we've just added "dual channel input support" in our latest 1.2.10, available on our Downloads Page. So, you can now plug in two sources, left and right, and monitor, view and analyze your tuning for both channels (1 and 2) independently. This is a great feature and one much requested by those using such instruments as the Chapman Stick with stereo output. Today, Ircam Lab proudly announce the availability of The Snail on the Windows OS platform. 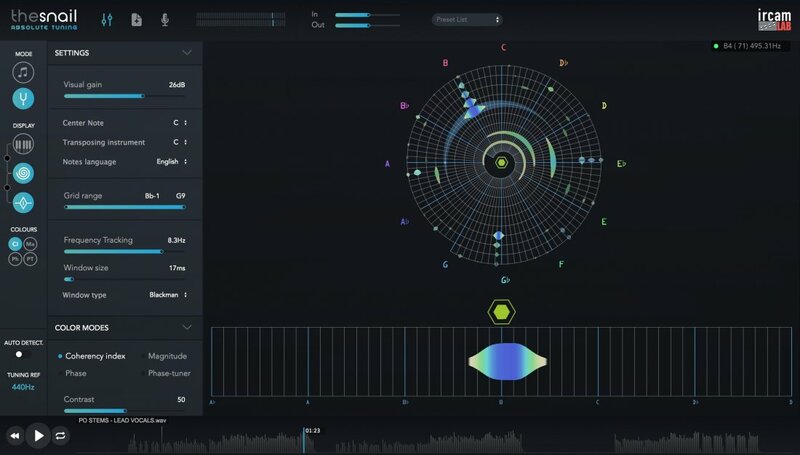 Over a year ago a revolutionary new standalone tuner software called The Snail was released on the Macintosh platform by Ircam Lab, it set new standards in this software category with its flexibility, its wide range of uses, and its unusual interface. This attractive Tuner/Analyser software with its user-friendly visual interface offers a new and extremely accurate way of tuning and analyzing instruments. It also breaks new ground with its abilty to show any intonation issues, phase discrepancies and actually visually represent the music and sounds in a way that helps anyone improve their listening and recognition of “in-tune". It is called "The Snail" due to it's cool spiral interface that represents every note from Bb-1 to G9 in concentric fashion from the highest to the lowest audible frequencies. 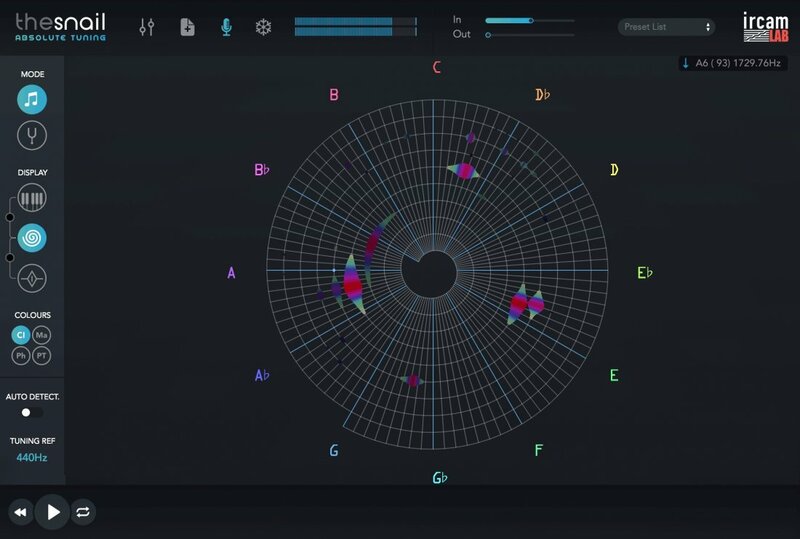 The Snail is a very high-precision frequency-domain analyzer which delivers an easy to understand representation of sounds, based on the scales and notes aligned in spectrally active zones. Resulting from numerous years of research and development, this product is based on a recent patented technology, conceived at the laboratory of Science and Technology of Music and Sound IRCAM-CNRS-UPMC based in Paris, France. View the product page here for more information... IRCAM Lab 'The Snail'. To celebrate this release of the Windows version, The Snail will be on special promo at the introductory Price of $49 (List price $99) until March 31st, 2017. The Snail is distributed by Plugivery and is available at select reputable pro audio dealers worldwide. There is a new version of The Snail! The new 1.2.8 version from Ircam corrects some GUI details to make the SNAIL even easier to use. The incorrect initialization of the intensity color mode has been fixed, and a GUI Plugin UI animation getting stuck occasionally on project reloading. The exciting news is there is a new function where you can click on the new icon which resembles a snowflake and 'freeze the display' so you can easily see how far or close you are in your tuning of an instrument or pre-recorded track. So, you will no longer have to play the same note over and over. Or loop a section of music to be able to see how far it is from the tuning you want. Users shall need to recreate their presets for this new version. Older presets are not compatible and do not recall correctly. Manually copy your settings for each parameter to a text file and then proceed to recreate them in the new version. The product name has changed to The Snail; previously Snail Analyser. Input is now active by default when you launch the application. It has a preset fade-in to avoid pops/clicks/feedback. Presets do not recall as expected.? Clicking 'Revert To Default' and then back to a preset failed to reload preset.? Note names ("Flats") are cut off in Zoomed Tuner view. AU Validation across Mac OS's and DAW's. C4 is now MIDI note 60 (middle C). Previously it was C3. DAW’s have different octave numberings, we thought this the best. In Snail, Zoomed Tuner and Sonogram views you will now see the Hz information display box in the top right-hand corner. As you center your mouse pointer on a note/thick blue line, you will see a green spot to indicate you are on that note. If you move away from the center you will see either a up or down arrow to indicate you can sharp ? or flat ?. A reference chart for note frequencies and their MIDI note names is avaialble in the manual. All views (Sonogram, Snail, Tuner) are proportionate to and displayed in a logarithmic scale. This means, as you move the mouse pointer to higher notes or octaves the scale is reduced. If you want finer resolution view of the frequencies please adjust the window size of The Snail interface or utilise the Zoomed Tuner view to visualise a 7 note span (of which you can select by entering Tuner mode, turning off Auto-Detect and clicking on the thick blue line for the center note you desire and just above the octave break lines for the note in the Snail view). In standalone, you can now press the “d” key to turn on/off Auto-Detect. Cut Off Frequency is now called “Frequency Tracking”. This parameter sets a +/- range for frequency analysis. For precise tuning analysis, the optimum setting is 2Hz. If you have a sound however with lots of modulation (pitch deviation) happening, raising the frequency setting in conjunction with the Window Size will allow smoother analysis, particularly for low frequencies. The Colour Modes have been reorganised to match the same as the left-hand panel. Today we are proud to announce the launch of our new revolutionary product, "The Snail"
The Snail is a Tuner, but one that will give a whole new insight into what tuning is all about. Ever had a guitar that never seems in tune as you move up the fretboard or has a resonance that you found was a problem or was a thing that you loved about it ? Well, now you will be able to see it ! The Snail shows you the fundamental and all the associated resonances and harmonics of any instrument or sound in an easy to see graphic display. Have you ever wondered what scale a certain song was in? The Snail will show you all the notes and harmonics during playback and their intensities so you can figure out what key it is played in. And it has the most sophisticated tuner on the market that shows you how close you are to ‘Absolute Tuning’ by slowing down and changing colour until you hit the exact pitch and frequency you need. It will without a doubt give your ears a training that will open them and educate them to how to tune for your style of playing. You will be able to find out what pitch any instrument or percussion is set at and help you to ‘fine-tune’ it to your needs. 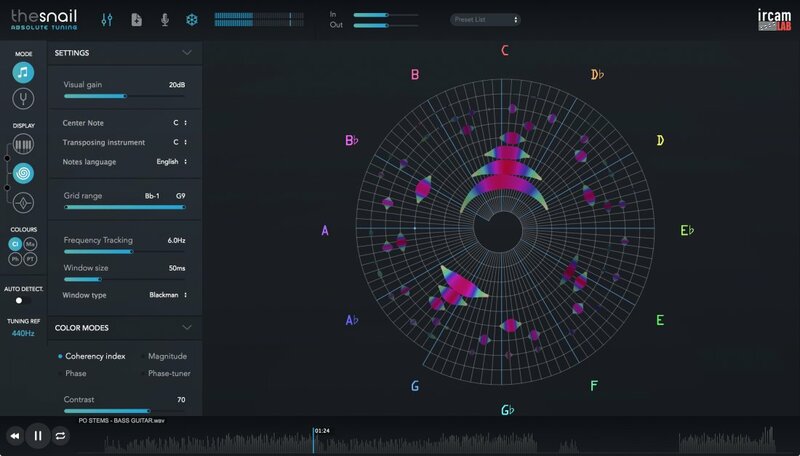 Its incredible analysis engine can even show you the composition of the harmonics of your own voice. No song or instrument will be able to hide its chromatic makeup from you any longer. The Snail will give you an new insight into the personal secrets of every sound and musical composition that exists. So if you want to be absolutely in tune, The Snail is the way to do it ! The Snail is available immediately from your preferred dealer. IRCAM Lab TS is Available !